Oliver Twist was Charles Dicken’s second novel written between 1837-39 originally sold in monthly installments. It told the story of an orphan born in a workhouse as an apprentice to an Undertaker. Oliver escaped heading for London where he met The Artful Dodger who was part of a gang of child pickpockets headed by the evil Fagin. 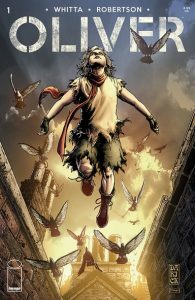 Image Comics has recently released the first issue of their Oliver series, re-telling the story in a different context. Set in the aftermath of World War III in London this version of Oliver is born into a gang of super humans made in a factory to replace the many who had died as a result of the war. These men are resilient to the post-war atmosphere in London and it’s questionable if Oliver, who is naturally born, can survive it too. This is my review of the comic. Cannot fault the art at all, especially that of London post disaster. Every page is dark with tints of blue or brown which gives the brilliant effect of a world without colour. The introduction of the story is pretty intriguing, pulls you in wanting more. I can see how Oliver is going to be the hope that the human race needs to be able to continue. I would say the story could have been written, so far at least, without the parallel to Oliver Twist, to me it doesn’t really have the same feel. Charles Dickens certainly wrote the book not pulling any punches against the criminal element of Fagin and others but those near Oliver at the moment I can see are potentially good and some potentially very evil characters. Oliver might have some super abilities as he was able to jump from one building to another without much effort. There was a part of the story when Oliver had just been born but then “3 years later” it appears he was more like a 8 year old, did he grow at super-speed? So far we know, when the child was born, there was a reference saying “that’s not normal” but we don’t know what that is as yet, there is a secret yet to be revealed. The story is excellent and maybe I didn’t grasp the flow of it. So far I score the comic as 4/5. Recommended.